In the lounge of The Ottawa Mission, a shelter and resource centre for the homeless in downtown Ottawa, four men sit at a table playing cards and laughing loudly. One of the men is clean-shaven, dressed in a button-down and jeans. The others are dressed in ill-fitting jeans and ripped windbreakers with unkempt beards and wild white hair. Another man sits silently in front of the filled bookshelves, his head in his hands and a beat-up backpack between his feet. These are just a few of the faces of poverty in Ottawa. These are just a few of the faces of poverty in Ottawa. Every day, thousands of people in Canada’s capital city go without food or adequate housing, and this number is rising each year. All of them need assistance. While the city has resources for those struggling, such as food banks and job training, many people involved in the anti-poverty community believe systemic changes have to happen in order to end poverty in Ottawa. Poverty is a very real, harrowing issue faced by many living in Canada, and the situation is not improving. In 2011, Statistics Canada found 12.9 per cent of Canadians are considered low-income before tax, down from 13.5 per cent in 2010. However, low income is not a true indicator of how many people are living in poverty. Numbers do not tell the whole story. In a July 22 piece for the National Post, Andrew Coyne argued low-income statistics prove Canada is doing well in terms of reducing the numbers living in poverty. In response, Rick Goldman wrote that those statistics, while accurate, do not represent reality. He argued other statistics such as the Market Basket Measure (MBM) show Canadians are still struggling to make ends meet. The MBM measures how many people cannot afford a ‘basket’ of necessary goods, a number that climbed from 10.2 per cent in 2007 to 12 per cent in 2011, according to Statistics Canada. The Alliance to End Homelessness (ATEH) Ottawa recently released its 2012 report card, which concluded some 7,000 people in Ottawa are homeless, with 858 families comprising a large part of that number. 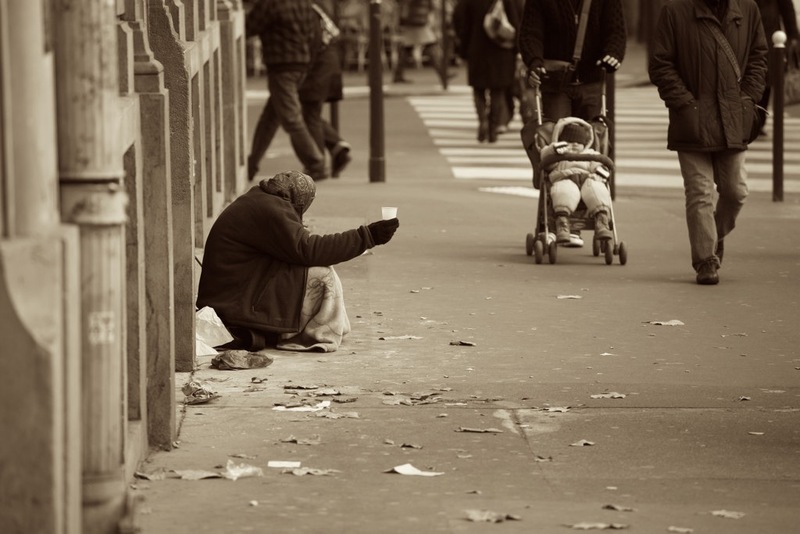 Poverty does not begin and end with homelessness, however. Many people are living in sub-standard housing, using food banks on a regular basis and living outside their means because they have no other choice. Food bank use in Canada reached an all-time high in March of 2012, with 882,000 people visiting food banks, according to Food Banks Canada. Samantha Ingram, communications co-ordinator at the Ottawa Food Bank, says numbers are increasing in Ottawa as well. Delivering food to over 140 member agencies, the Ottawa Food Bank is the hub of a system trying to feed people. The Ottawa Mission is one of these member agencies. The sprawling bricked building on Waller St. provides 235 beds and over 1,000 meals daily. Shirley Roy, media and community relations manager at Mission, says it has also seen an increased number of people coming in for meals. Curtis Bulatovich, youth engagement co-ordinator at ACORN Ottawa, an advocacy group for those living with little or no income, says ACORN is concerned about the upswing in food bank use and the lack of stable housing for those in need. He says high rent prices give low-income earners little or no choice as to where they live. ATEH’s report card shows apartment rental costs increased by an average of three per cent in 2012, and Ottawa residents earning minimum wage pay 46 per cent of their income to rent a bachelor apartment. Rent is a major issue for John, who currently stays at Mission. John struggled with alcoholism following his divorce five years ago. After losing his job due to layoffs and filing for bankruptcy, he “couch surfed” for a few years before seeking help for his addiction. After attending detox centres and rehabilitation services, John had a hard time finding somewhere affordable to live that was in an area conducive to his recovery. He and Roy say it’s important to be in a place that is safe, clean and supportive. The question of how to eradicate poverty is not easily answered. Mission’s client services offer opportunities to those needing help, including comprehensive job training. Through its ‘Discovery University’ program, clients can take free university courses taught by Ottawa professors. “It’s really helped people realize their potential,” Roy explained. She says the idea behind these measures is to ensure those who are struggling can gain the skills needed to participate in the work force long-term. This is one way poverty can be addressed with a stable, proven solution. ACORN Ottawa participates in petitions to the government to raise the minimum wage. However, Woolley says there are problems with raising the minimum wage. John says he and his children used to drive past Mission, his children wondering aloud about the “poor men” sitting outside in the middle of the day, disheveled and smoking. “I want you to look at that and think about how fortunate you are,” he told them.